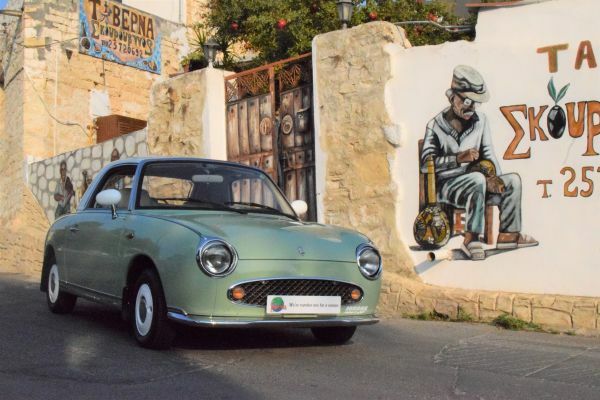 Nissan Figaro For sale UK Registered direct from Japan including the Nissan Figaro Left Hand Drive for sale supplied by Figs4u, Algys Autos Ltd, THE Best quality Nissan Figaro available in the World! 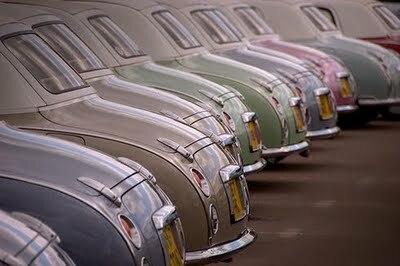 All Nissan Figaro colours and budgets vailable for Sale including Left Hand Drive Nissan Figaro Via Algys Autos. The World’s Premier supplier direct from Japan for over 20 years! Algys Autos own Figs4u, they have been without doubt the World’s premier Nissan Figaro supplier for 20+ years! 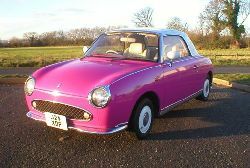 The Nissan Figaro we supply are far in advance of the ‘standard’ quality. 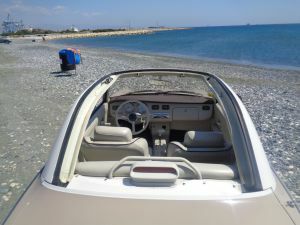 Every one of our Cars is purchased in Japan by our highly experienced staff and then can receive full refurbishment including full engine service, new hood, Paintwork in A1 condition, A1 Chrome work, Original CD Stereo fully serviced and digitally enhanced with i-pod and bluetooth connections, Leather Interior re-conalised etc etc. We can supply any ‘bespoke’ colour including ‘Barbie Pink’. 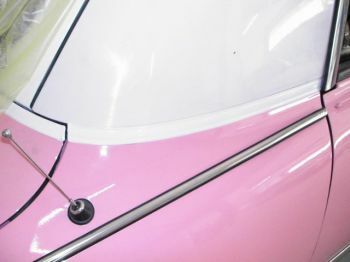 We can import any quality Nissan Figaro for you direct from Japan into our Bristol Garage, UK and then refurbish to your budget and requirements. All our Figaro have low miles, from 3,000 to a max of 65,000! You are always more than welcome to visit our Garage at Bristol where we can advise on beautiful Examples. You should also be fully aware that the value of a good Figaro is increasing annually in excess of £1000 and have become a very sought after appreciating retro classic. 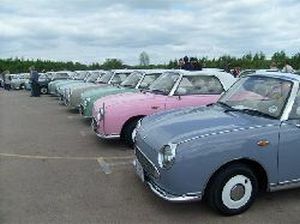 Algys Autos own Figs4u and are the only known Left Hand Drive Nissan Figaro supplier in the World! 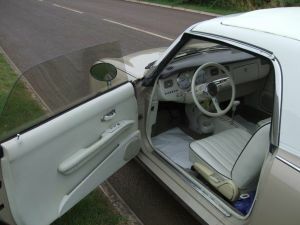 If it is a left hand drive Nissan Figaro you want then send us an email or visit our Figs4u website. 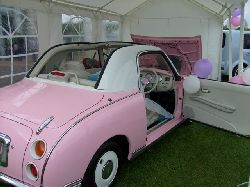 Nissan Figaro For Sale. Simple, we import fresh stock direct from our Japan garages NOT from very inferior auctions or from Nissan Figaro for sale circulating for sale within the UK. Most UK traders buy from the used UK market, generally these cars are tired and have been subjected to the cruel and harsh winter roads and conditions. Ask to see the Japanese auction sheet and proof they imported it from Japan…..if they can’t or won’t provide it, turn around, walk away and come to the experts. What is the Nissan Figaro? In 1991 Nissan Motor Company were to celebrate 50 years of manufacture and thus decided to celebrate with the design and production of a very limited car. They hired the services of the Pyke design team and gave instructions the car was to be something ‘Very special and that would reflect both style and quality for many years to come’. Thus the Nissan Figaro was born. Nissan announced that they were to produce 20,000 vehicles (to be released in three batches, between February and September 1991), but demand was so great that potential users had to enter a lottery in order to win the chance to buy the new car, which was priced at 1,870,000 yen (£10,000). Literally tens of thousands of lottery tickets were sold and winning tickets changed hands 4 far in excess of the launch selling price! 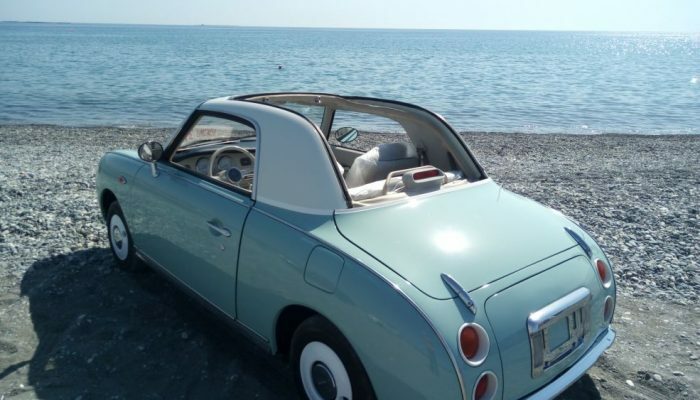 Nissan Figaro for sale at the best Prices and Quality Available anywhere in the UK! Click here to Email for the No-Obligation enquiry, tell us what you want! 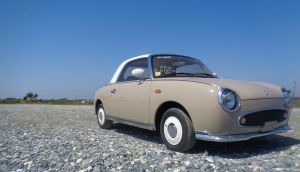 Nissan Figaro For Sale Figs4u, Algys Autos. 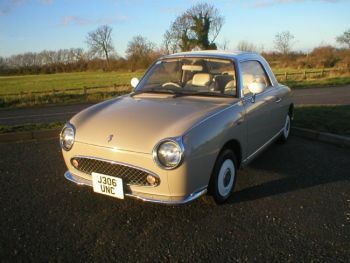 The Nissan Figaro today regularly exceed the initial cost price and good examples appreciate by about £1000 per annum! This car turns heads wherever it goes. Some are fitted with very rare after sales original Alloys. All are produced in 1991 and attract either H or J Reg, All Algys Autos (Figs4u) cars are in excellent condition, fully refurbished, fully serviced with new cam belt, distributor, rotor arm, all new filters and aircon gas, the white leather interior is replaced where necessary with reconnalised leather, new hoods, original Retro CD stereo systems digitally enhanced and upgraded in 100% working order. 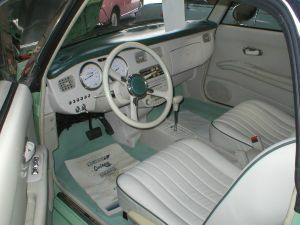 The bodywork and full leather white interiors are in A1 condition and all have low mileage. Each has 12 months Mot, 12 months Road tax, UK registered and on the road. 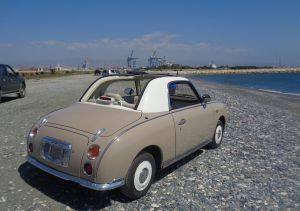 We also supply Nissan Figaro under the Import Scheme. Call, email or click the ‘Import Scheme’ link at the top of this page for details. Also available in the Pyke range are the fantastic advertising promotional feature van, Nissan Escargot (Nicknamed ‘The Snail’ as snail is Escargot in French) and the retro Nissan Pao. Nissan Figaro For Sale. 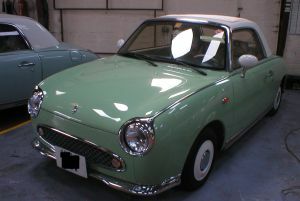 Remember if you are looking for Nissan Figaro For Sale imported and supplied for sale direct from Japan Algys Autos (Figs4u) are the premier supplier! Nissan Figaro Left Hand Drive – The World’s rarest Nissan Figaro for sale! Algys Autos have supplied many Nissan Figaro to the USA and Canada over the years and continue to supply the USA and Canada Nissan Figaro Please feel free to email us or call from the USA or Canada for any advice and arrange to have a Nissan Figaro shipped to any USA or Canada port you chose. 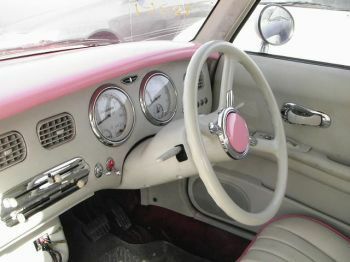 Remember we have Nissan Figaro in Right or left Hand Drive for sale. 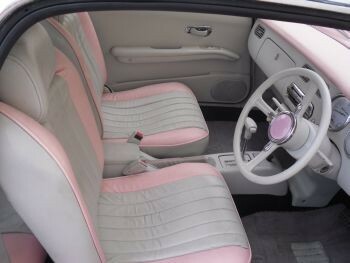 We shall be taking the very limited orders for the next Left hand Drive Nissan Figaro for sale soon! You will need to request to be included in the ‘notification’ email list, be able to secure the car with a deposit and above all be patient! The process is very time-consuming and specialised. But the results are Jaw-Dropping! Email or visit our Nissan Figaro Website Figs4u Thanks. Nissan Figaro Left Hand Drive – The rarest Nissan Figaro for sale in the World!